I'm back again for August's Beauty Wishlist! Keep reading to find out what's on my list. The first product is the Liz Earle Cleanse and Polish. I've loved this product for a long time, however I'm beginning to run out of my current bottle, and I need some more! Staying with skincare, there's three products that I've come across that are new to me that I want to try out. I really want to try the Elemis Pro-Collagen Hydra-Gel Eye Masks, I've never used an eye mask before and I'm intrigued as to how they can help my eye area. Another skincare product that has caught my attention is the Clinique Moisture Surge Face Spray. This spray helps to inject moisture back into your face which I really love the sound of. My skin can get quite dry sometimes, especially after cleansing it. The Charlotte Tilbury Instant Magic Sheet Mask has also made it on to my wishlist this month. I'm not normally a fan of sheet masks but the word 'magic' sells it to me, and I've never been disappointed by Charlotte's products before! While we're on the subject of Charlotte Tilbury, I've added the Filmstar Bronze and Glow to my wishlist, I really love the look of this palette, it looks so luxurious, and having seen the product applied, I love the finish it gives. The other highlighter product I have my eyes on is the MAC Mineralize Skinfinish, again I really like the finish this has on other people's faces when they've worn it. I've been thinking recently of changing up my foundation and perhaps even trying a new brand! The MAC Studio Fix Fluid has lots of good reviews that I've seen and also is said to last really well throughout the day, which is so important to me. Last but not least, the last item on my wishlist is the Bumble and Bumble Surf Spray; I've loved my shorter hair, and especially when I put waves in it. The Surf Spray would be great to add a bit more texture to that. 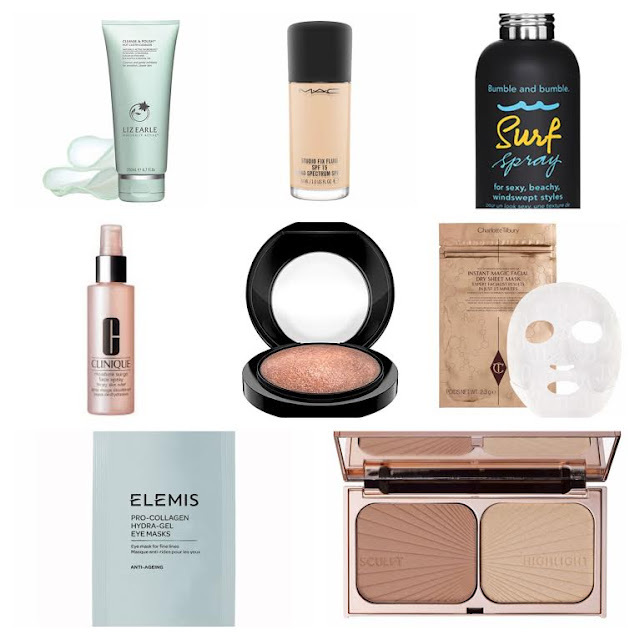 I hope you enjoyed reading this month's beauty wishlist! The CT duo looks lovely, I need to try it at some stage!